Ash gourd keeps both our body and mind cool !! The much needed one for the hot summer !! 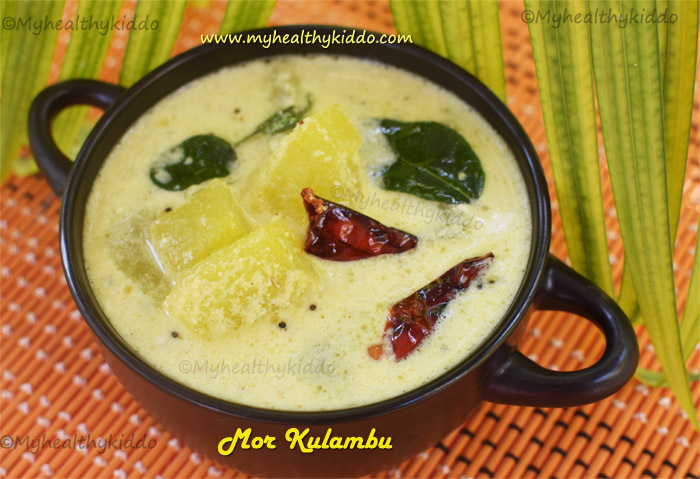 The base buttermilk gravy or mor kuzhambu recipe is same, but the choice of veggies can differ as per your taste buds. Ashgourd/poosanikai can be replaced by chow chow/chayote squash or cucumbers/vellarikai or arbi/taro root/seppan kizhangu. Ladies finger/vendakkai too can be used. Pls see tips section below to know how to use ladies finger in mor kuzhambu. You might also like “Ash gourd raita” – click here for link..
First remove the centre soft & spongy parts along with seeds. Then peel off the skin using sharp knife. Wash the ashgourd and then chop into desired-sized pieces(not too small and not too big). Add the chopped veggies to a pressure cooker along with ½ cup to 1 cup water depending upon veggies quantity. Do not add till immersing level. Just lil water would suffice.. Add ¼ tsp turmeric powder, ¼ tsp rock salt and gently mix with the water in it. Pressure cook for 1 or 2 whistles depending upon tenderness of the ashgourd. I cooked for 2 whistles. Pls note that ashgourd will not be cooked again in the gravy. Strain the cooked water to a bowl and allow it to cool down completely. Take quarter of a coconut and add the coconut pieces to mixie jar along with 2 long green chillies, ½ inch ginger(skin-removed), ¼ tsp turmeric powder, 1 tsp cumin seeds/jeeragam. Grind it coarsely. Then add little of cooled, ashgourd-cooked water and grind again to a coarse paste. Take 4 to 5 cups of thick curd and beat it with a whisk or buttermilk ladle until smooth. Then add the ground paste to it. Use the remaining ashgourd cooked water to rinse the mixie jar and pour into the curd. Add the cooked ashgourd to the curd. Add ½ tsp rock salt or as required and mix well. Wash few curry and coriander leaves and keep ready. Add a tbsp of coconut oil and once hot, simmer & add ¼ tsp mustard seeds/kadugu. Once spluttered, add ¼ tsp urad dal and ⅛ tsp fenugreek seeds/vendhayam. Once slightly color of urad dal and methi seeds start to change, break a dry red chilli and add. Then add curry leaves and switch off. Add the tempered items to the curd mix. Note that the curd mix is still not on stove. Do not mix.. Now, keep the curd mix in the stove in medium flame. Do not boil. Once frothy, switch off immediately. Add chopped coriander leaves(add along with stems for more flavor). Do not close immediately or mix yet.. Just mix it at the time of serving. 1.mor kuzhambu should be thick. So, do not add more water. 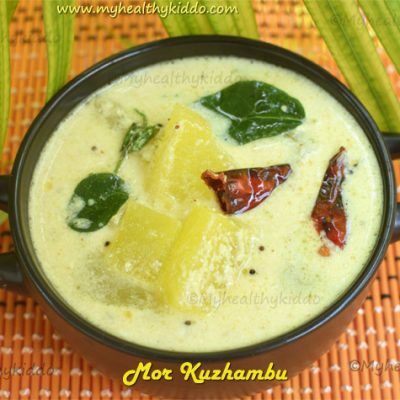 2.Do not boil mor kuzhambu as it will start to curdle. Just switch off, once it is well frothy. 3.Tempered items should be added to the curd mix. Do not add curd mix to the tempered pan as it will curdle in heat. 4.Ashgourd can be replaced by chow chow/chayote squash or cucumbers/vellarikai or arbi/taro root/seppan kizhangu. Ladies finger too can be used. Fry 1-inch sized chopped ladies finger in oil until cooked and then add to curd mix in place of cooked ashgourd. 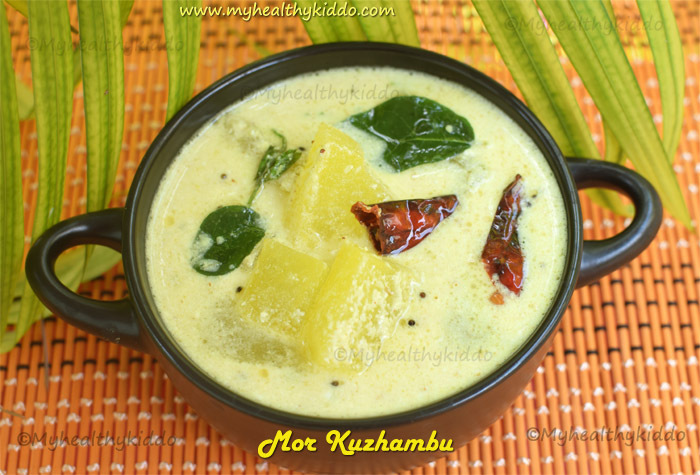 poosanikai mor kuzhambu – How to make poosanikai mor kuzhambu ? 1.First remove the centre soft & spongy parts along with seeds. Then peel off the skin using sharp knife. Wash the ashgourd and then chop into desired-sized pieces(not too small and not too big). 2.Add the chopped veggies to a pressure cooker along with 1/2 cup to 1 cup water depending upon veggies quantity. Do not add till immersing level. Just lil water would suffice.. Add 1/4 tsp turmeric powder, 1/4 tsp rock salt and gently mix with the water in it. 3.Pressure cook for 1 or 2 whistles depending upon tenderness of the ashgourd. I cooked for 2 whistles. Pls note that ashgourd will not be cooked again in the gravy. Strain the cooked water to a bowl and allow it to cool down completely. 4.Take quarter of a coconut and add the coconut pieces to mixie jar along with 2 long green chillies, 1/2 inch ginger(skin-removed), 1/4 tsp turmeric powder, 1 tsp cumin seeds/jeeragam. 5.Grind it coarsely. Then add little of cooled, ashgourd-cooked water and grind again to a coarse paste. 6.Take 4 to 5 cups of thick curd and beat it with a whisk or buttermilk ladle until smooth. Then add the ground paste to it. 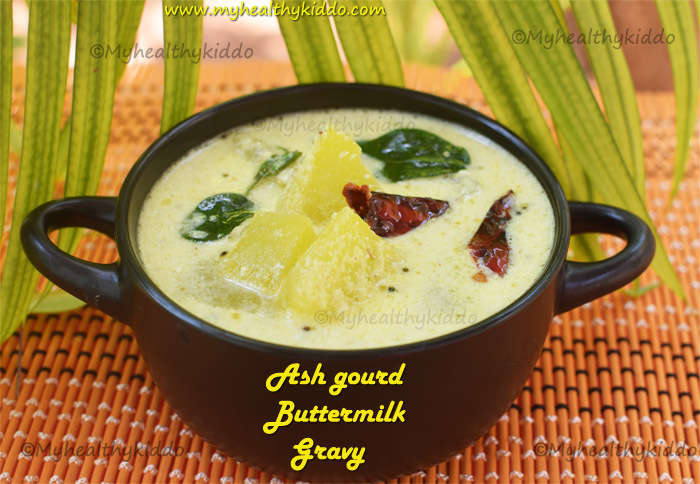 7.Use the remaining ashgourd cooked water to rinse the mixie jar and pour into the curd. Add the cooked ashgourd to the curd. 8.Add 1/2 tsp rock salt or as required and mix well. Wash few curry and coriander leaves and keep ready. 9.Add a tbsp of coconut oil and once hot, simmer & add 1/4 tsp mustard seeds/kadugu. Once spluttered, add 1/4 tsp urad dal and 1/8 tsp fenugreek seeds/vendhayam. Once slightly color of urad dal and methi seeds start to change, break a dry red chilli and add. Then add curry leaves and switch off. Add the tempered items to the curd mix. Note that the curd mix is still not on stove. 10.Do not mix.. Now, keep the curd mix in the stove in medium flame. Do not boil. Once frothy, switch off immediately. Add chopped coriander leaves(add along with stems for more flavor). Do not close immediately or mix yet.. Just mix it at the time of serving. poosanikai mor kuzhambu is ready ! Serve with rice along with spicy vegetable sides. Yummm…! mor kuzhambu should be thick. So, do not add more water. Do not boil mor kuzhambu as it will start to curdle. Just switch off, once it is well frothy. Tempered items should be added to the curd mix. Do not add curd mix to the tempered pan as it will curdle in heat. If you wish to use ladies finger in place of poosanikai, fry 1-inch sized chopped ladies finger in oil until cooked and then add to curd mix in place of cooked ashgourd.